Situated in the north of the city centre, Manchester Arena is attached to Victoria Station, easily reached by train direct from the airport station. This 21, 000 capacity venue is one of the busiest and largest in Europe hosting arena artists and sporting events such as ice hockey and boxing. The venue itself is on the corner of Trinity Way, Hunts Bank and Great Ducie Street. It’s had a few names over the years and has been previously know as the NYNEX, Manchester Evening News Arena and Phones 4 U Arena. 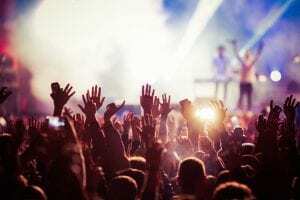 All the iconic rock and pop artists of the era from The Rolling Stones to the Spice Girls have headlined to crowds of thousands. Likewise the venue is a must stop on the tour of all the top stand-up comedians. Peter Kays record breaking Tour That Didn’t Tour Tour sold over 1.2 million tickets! 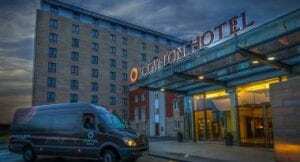 Located in the heart of the city centre, Manchester Arena is easily accessible from Clayton Hotel Manchester Airport. Trains run regularly direct from the airport station to Victoria, next door to the arena. We offer complimentary shuttle bus between the hotel and Airport station 24 hours a day. A taxi journey would cost approximately £20 – £25 and can be pre-booked via reception.